A new kind of filler of car air purifiers and air fresheners is made of organic. That is an eсo-friendly fiber packed in a tin can. 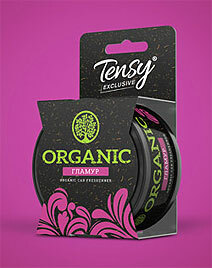 The TENSY car air fresheners with the organic filler come in a variety of fragrances from natural to perfume. Please note: do not install fragrances in the airbag deployment area.